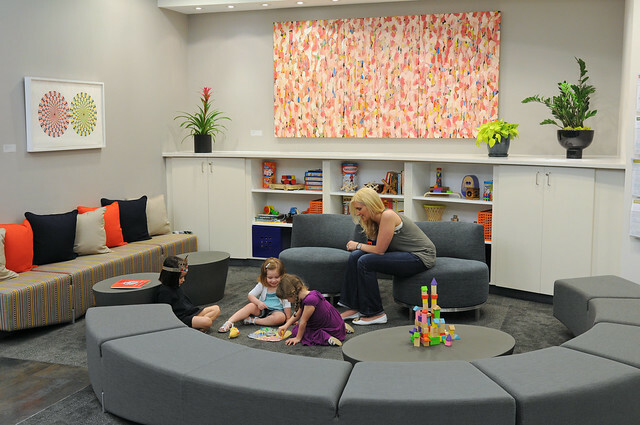 When children and their families visit our headquarters, they find a space that was designed specifically to be child- and family-friendly. Public spaces are bright and inviting, full of artwork from private collections and from our student art exhibitions. There are also play areas stocked with toys, private waiting areas, WiFi hot spots, a café area, vending machines filled with healthy snacks, and comfortable meeting rooms. Patient Navigators are on hand to help visitors find what they need. Our headquarters houses the office of the president and the executive team; our New York City clinical practice; the administrative and foundation offices and the childmind.org team; and the Center for the Developing Brain, along with some staff supporting the Healthy Brain Network. The Child Mind Institute’s New York office is the national headquarters for the foundation’s public education mission and the support center for all national and local programs and initiatives.